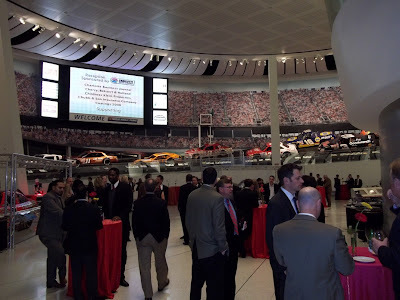 The Charlotte Chamber held its 2010 Annual Meeting last night at NASCAR Hall of Fame. I attended the event for the first time in 2008 (when Michael Jordan was honored), so I knew to look forward to a great evening. You wouldn't necessarily think that a business event such as this would be entertaining, but there's a reason 1,800 people showed up (at $75 a ticket). 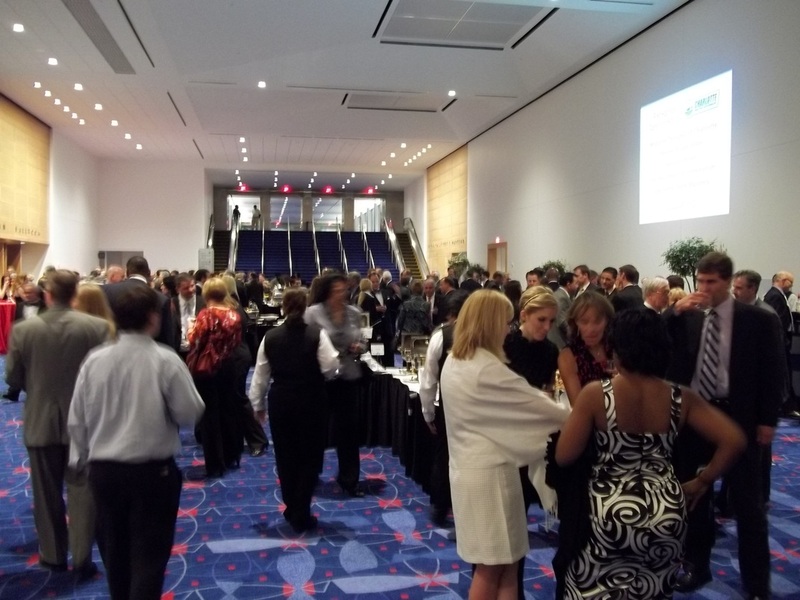 The Charlotte Chamber and the teams of creative people they hire to put on the event, once again gave a top-notch performance. With the theme "Brand New Day," including an opening performance by the Charlotte Symphony Orchestra (I can still hear the catchy tune in my head), the annual meeting was a celebratory event after a worrisome last couple of years for people in all levels of business. 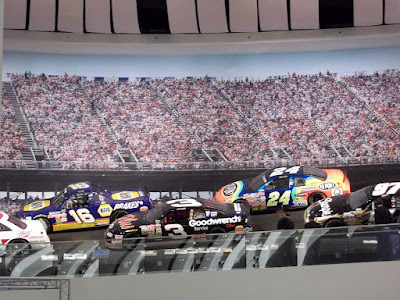 The Chamber touted the number of companies it helped relocate to, expand, or open new offices in Charlotte during the past year, and the number of new jobs created as a result--4,400--reminding us of the big announcements that came in 2010 from Husqvarna, Electrolux, Siemens, Fifth/Third, and others. And there was another big announcement, saved especially for the event. 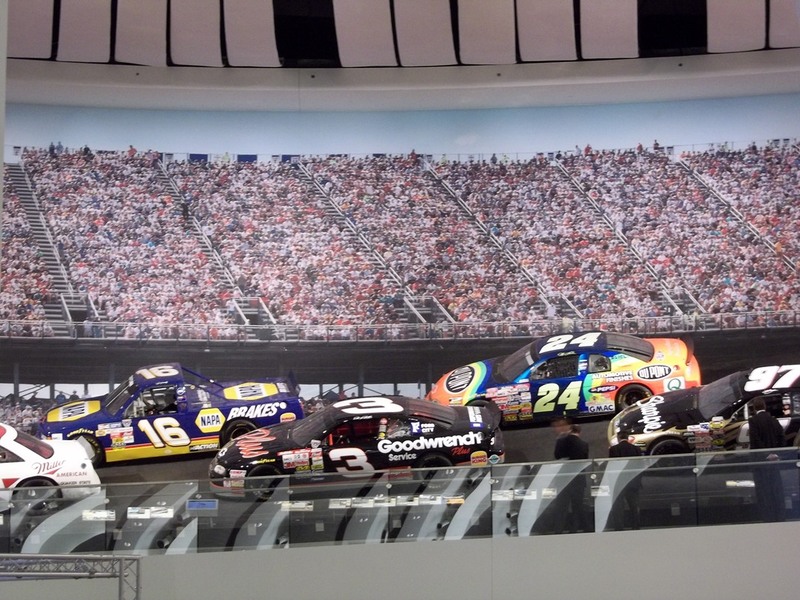 Shaw Power Group's CEO took the stage and announced that his company would be adding 225 jobs in Charlotte, 80 percent of those being engineering jobs with an average salary of $95,000. The audience was instructed to ring the little gold bells that were placed in our seats. The ringing of the bells was to mirror a practice that has become a tradition at the Chamber whenever a new business announcement is made. The evening also featured the passing of the gavel from the 2010 Chamber chair, David Darnell of Bank of America, to 2011 chair Pat Rodgers of Rodgers Builders. Carolinas HealthCare System was given the Belk Innovation in Diversity Award. And Leon and Sandra Levine were honored with the Citizen of the Carolinas Award. As the founder of Family Dollar, Leon Levine has amassed a fortune, and he and his wife have given a lot of it away to charities, the arts, and education. Perhaps the best thing about the program is that it only lasted an hour. So the crowd quickly got to the food. If you've ever been to the Annual Meeting, you know the food offerings are always spectacular. I was actually a little embarrassed as I walked through the crowd with a plate that looked like I didn't want to have to get up for seconds. Complimentary drinks made the cycle complete. If the food was the star of the evening, the venue was its shining co-star. 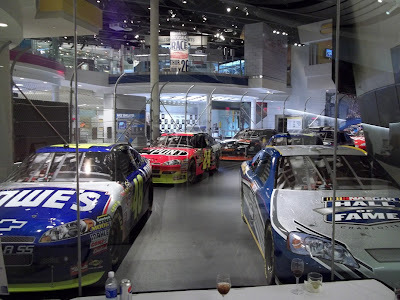 NASCAR Hall of Fame has a beautiful ballroom, which is connected to the Charlotte Convention Center. And we weren't just limited to the ballroom and lobby, the hall was opened for guests to peruse the exhibits. 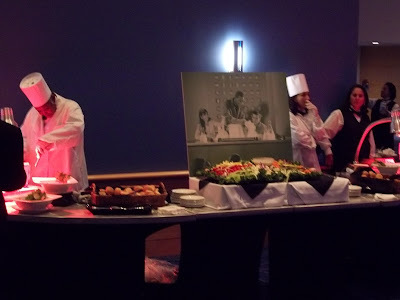 There were even food and drink stations spread throughout. 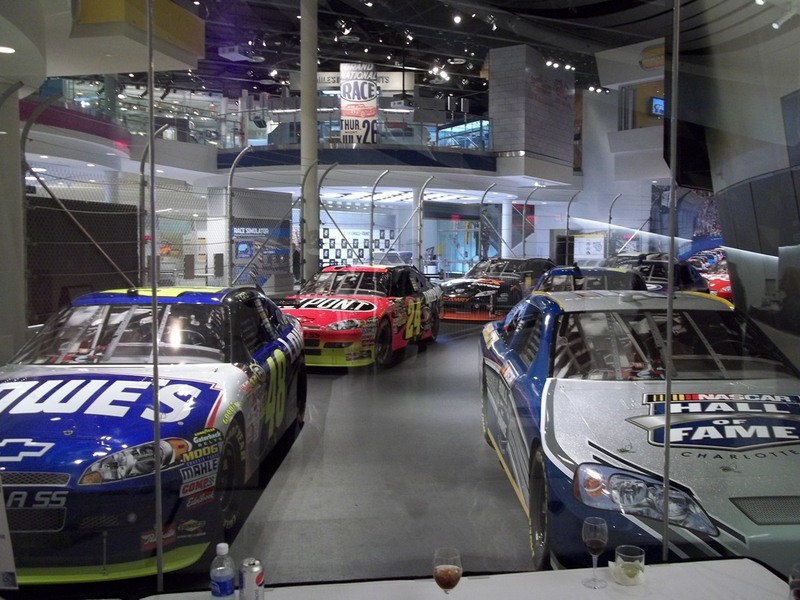 There's nothing like walking along Glory Road, passing the replica race cars with a glass of wine in hand. There was also plenty of networking going on. I was able to catch up with a few colleagues and also saw many astute businessmen and women whom I know of but don't know personally (I took the liberty of introducing myself to a few of them). 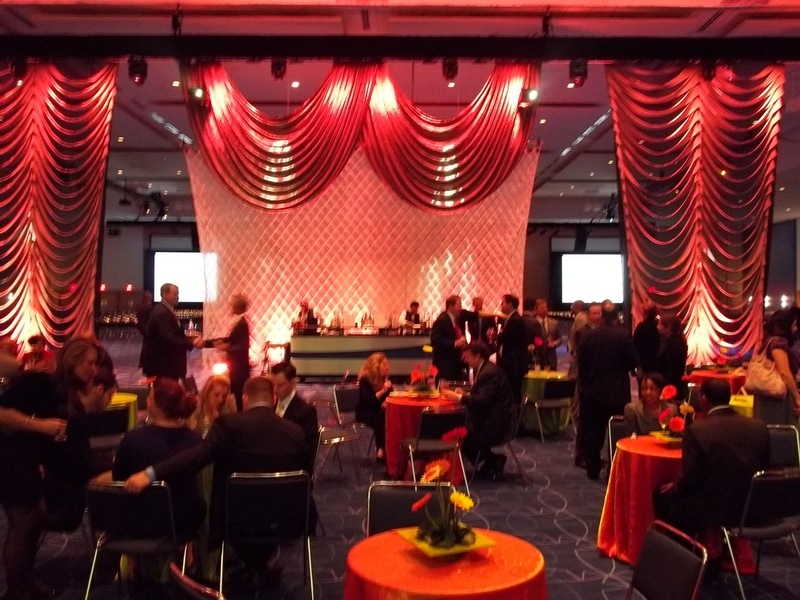 Hopefully, when the 2011 Annual Meeting comes around there will be even more to celebrate--and the brand new day is a bright one.